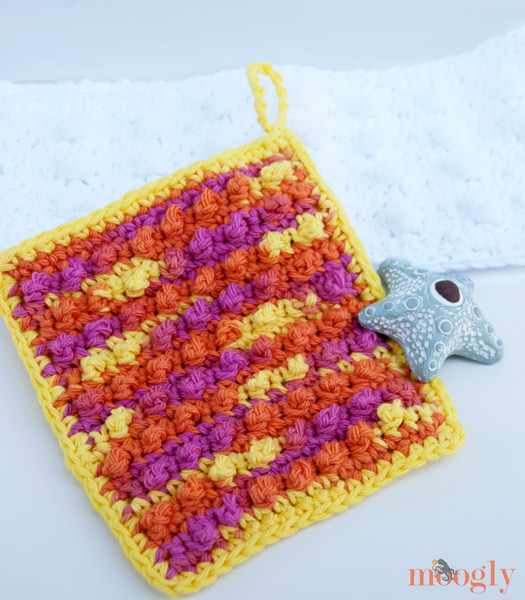 Previously on Moogly, I shared a video tutorial for the Picot Single Crochet (PSC) stitch, and the Granule Stitch pattern. 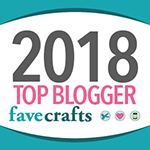 That inspired a reader request for a bath mitt to compete the Pampering Bath items already available – and the Pampering Picots Bath Mitt was born! 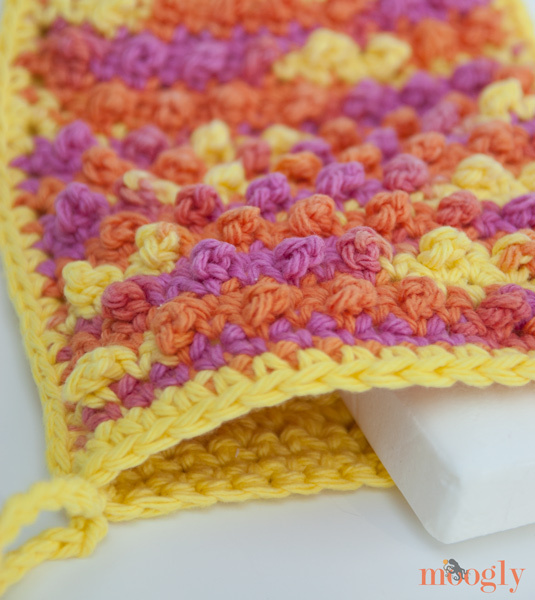 This is a fantastic beginner pattern (also perfect for a week when I’m swamped with middle child’s birthday preparations)! 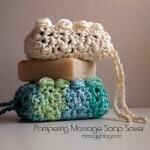 If you can sc and dc, you can make this bath mitt! 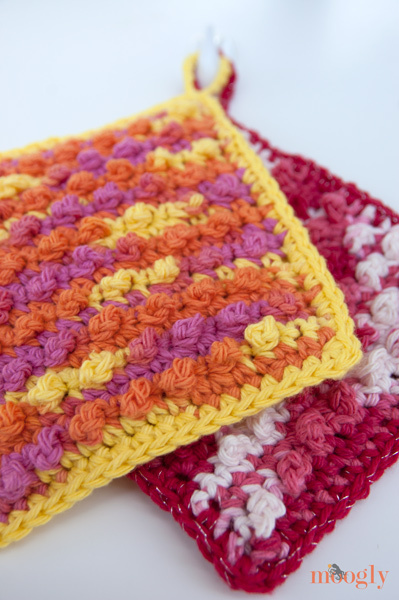 The PSC stitch is super easy, as the video tutorial shows, but it gives an amazing texture. 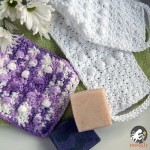 The Pampering Picots Bath Mitt is a wonderful pattern for new crocheters to make for holiday gifting! 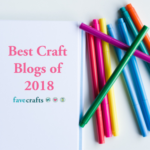 The loop is optional, and the colors are up to you – there are lots of great yarns that will work, but anything made of cotton, linen, or even bamboo would be lovely! 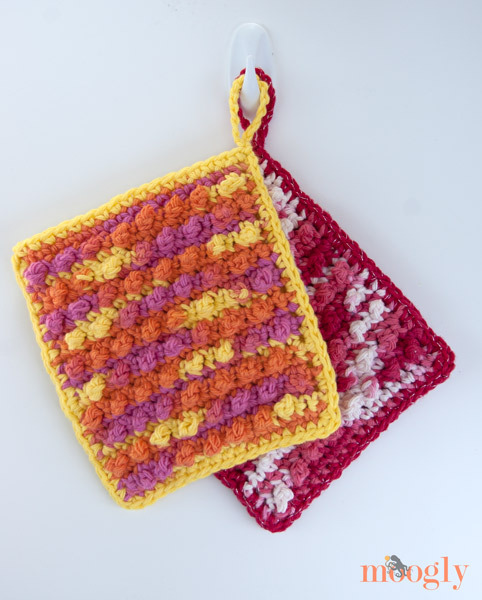 The bath mitt is made in two pieces that are worked flat and then crocheted together – mix and match the pieces for a custom mitt! Rows 6 – 21: Repeat Rows 2 – 5 four more times. 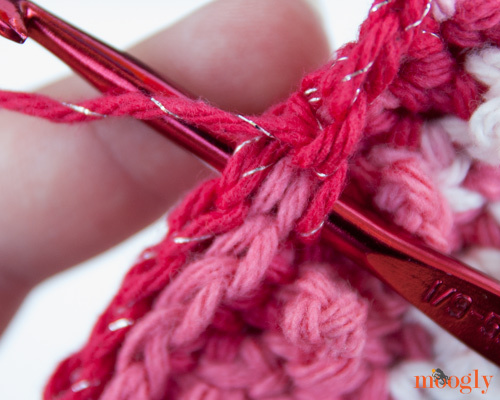 Break yarn and use the needle to weave in ends. Rows 4 – 15: Repeat Rows 2 – 3 six more times. Row 16: Ch 1, sc in each st across. 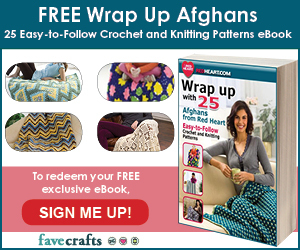 (17 sts) Break yarn and weave in ends. 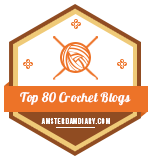 Crochet the Sides and 1 End Together: Hold the Picot and Flat pieces together, wrong sides together, so the picots face you. Insert your hook through both layers on one side, as shown below. Work sc stitches, going through both layers with each stitch, along one side, across one end, and down the other side. Work 3 sc into each corner. 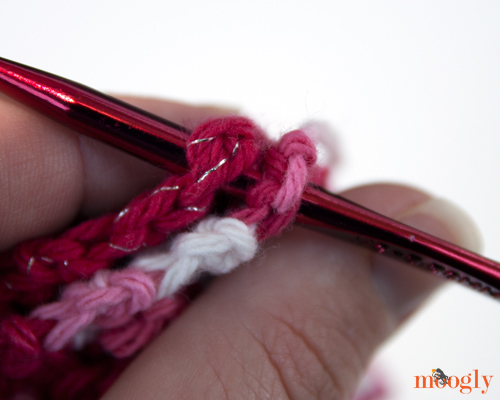 Crochet around the opening: Ch 1 and sc along the side facing you – just the one side, this is working around the opening of the mitt. 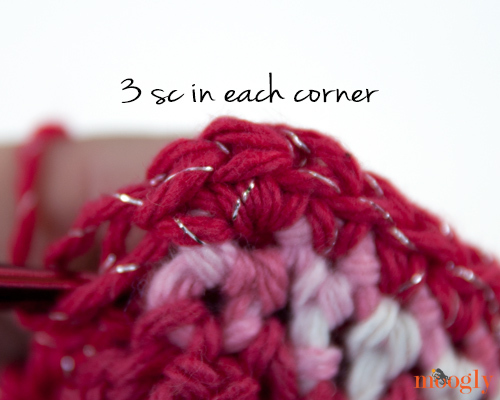 Keep crocheting around the opening, along the back piece until you’ve crocheted all the way around the opening of the mitt. Sl st in the first sc of the opening, and ch 15 (or to length desired) for the hanging loop. 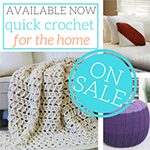 Break the yarn and use the needle to sew the end of the loop to the last sc st.
And that’s it! 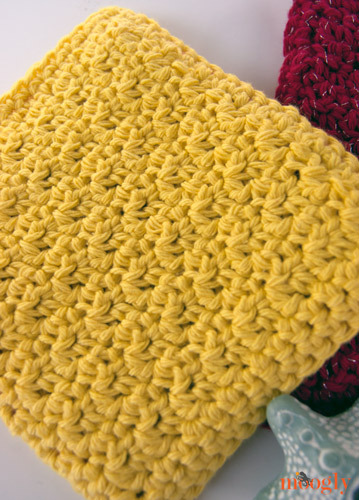 You’ve made a bath mitt! 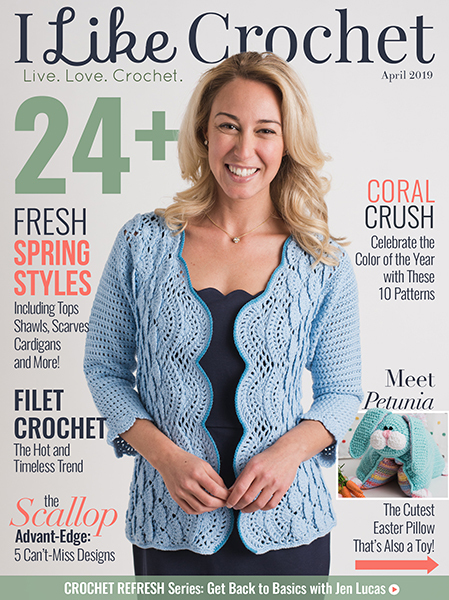 For experienced crocheters, this pattern will be a breeze, and for new crocheters it’s a great skill builder – and a fun gift idea for the holidays! 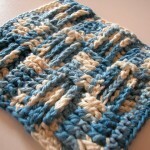 I hope you’ve enjoyed the pattern for the Pampering Picots Bath Mitt – tell me what you think in the comments! Absolutely love, love, love this! Just watched the tutorial and it’s so easy. Will make several for upcoming birthdays and for Christmas gifts. Thanks, Tamera, for sharing your wonderful creativity with us! Thanks so much Romy! I’m so glad you like it! What is the finished size of this little cutie?? I made one this evening and it turned out great! I also made the hanging loop to fit over my thumb which is perfect to keep it from sliding around on my hand. Can’t wait to use it! 😀 I’m so happy to hear it! Funny thing, though I haven’t checked in a day or 2, I was thinking about trying to work this up as a bath mitt myself–hadn’t gotten to the point of leaving off the thumb–silly work responsibilities interfere with my mental meanderings sometimes…I will make this, most definitely! Fun idea Virginia! Thanks so much! But was it me or do the rows on the pattern not add up? 😀 Fantastic! Thank you Sarah!